THE #1 INTERNATIONAL BESTSELLER! 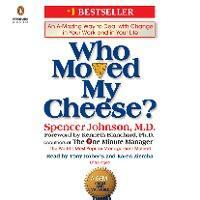 A timeless business classic, Who Moved My Cheese? uses a simple parable to reveal profound truths about dealing with change so that you can enjoy less stress and more success in your work and in your life. It would be all so easy if you had a map to the Maze. But things keep changing... Most people are fearful of change, both personal and professional, because they don't have any control over how or when it happens to them. Since change happens either to the individual or by the individual, Dr. Spencer Johnson, the coauthor of the multimillion bestseller The One Minute Manager, uses a deceptively simple story to show that when it comes to living in a rapidly changing world, what matters most is your attitude. Exploring a simple way to take the fear and anxiety out of managing the future, Who Moved My Cheese? can help you discover how to anticipate, acknowledge, and accept change in order to have a positive impact on your job, your relationships, and every aspect of your life. SPENCER JOHNSON, M.D., is the originator of The One Minute Manager System(TM) and co-author of the New York Times bestsellers The One Minute Manager(R), The One Minute Sales Person, and One Minute for Myself. His other bestsellers include Who Moved My Cheese? ; The Precious Present; and Yes or No: The Guide to Better Decisions.Called "The King of Parables" by USA Today, Dr. Johnson is often referred to as the best there is at taking complex subjects and presenting simple solutions that work. He received a B.A. degree in psychology from the University of Southern California, an M.D. from the Royal College of Surgeons in Ireland, and medical clerkships at Harvard Medical School and the Mayo Clinic. There are over 50 million copies of his books in print worldwide in 47 languages.Few names are as recognized in American business as KEN BLANCHARD'S. His One Minute Manager(R) Library has sold millions of copies and been translated into more than twenty languages, and he has written or co-authored a number of other popular books as well. Ken is a captivating and sought-after speaker and business consultant, who has shared his unique approach with a multitude of Fortune 500 companies.Ken has received many awards in management and leadership. He has won the National Speakers Association's highest honor, the "Council of Peers Award for Excellence," and the Golden Gavel from Toastmasters International, and was inducted into the HRD Hall of Fame.